One of the most important things that determine the success of your product is the amount of trust that you have with your customers. Building trust comes through many means. Do what you say. Say what you do. Don’t be a jerk. Deliver an amazing product. Listen to customer’s requests, concerns, & ideas. Let your customers feel like they are a part of shaping the product and not just on the receiving line of the product. Small companies have to do a lot to build trust because they’re new, they have no track record, and customers are quick to cast judgment when something goes askew in the experience. I think this happens because if you don’t like what one company does, you can probably find another company who does the same thing but has a better experience. If you don’t trust Lyft, try Uber. If you have a bad experience with Tinder, then try Hinge (or Bumble, or Coffee Meets Bagel, or a ton of other dating apps). With larger companies though if you have a bad experience with them, you get frustrated but chances are, you probably won’t change. Over the years, we’ve seen Facebook do things and make decisions that users hated and protested. But, did people leave? Nope. Why? Because they can’t live without Facebook now! Google is a company that continues to fascinate me and perplex me. I recently had an experience with Google that really frustrated and surprised me. 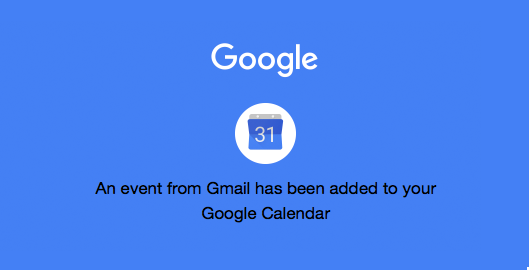 Google recently launched a new feature in Google Calendar called Events From Gmail. 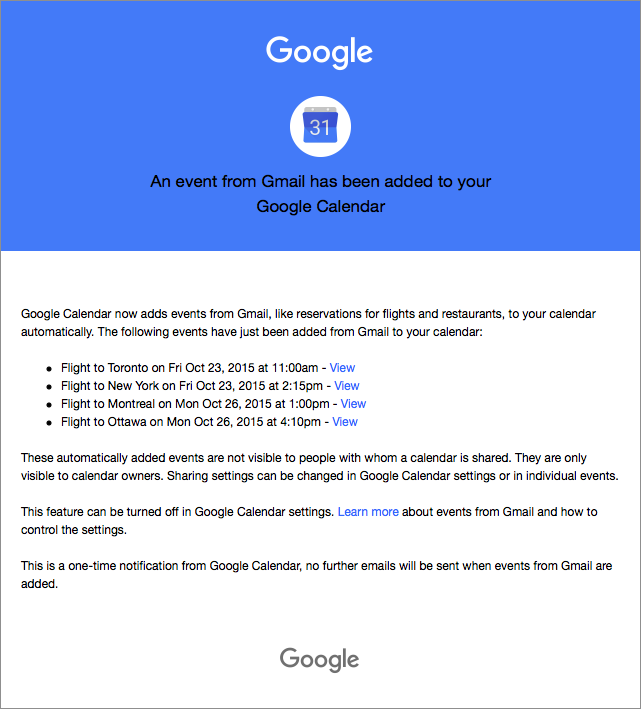 With this feature, Google sifts through your email to identify events. Then, Google takes those events that it’s identified and adds them to your calendar. In theory, this is a nice feature. However, in reality, this causes total chaos. Here’s my experience with Events From Gmail. To let me know about this new feature, Google emailed me to tell me it identified a bunch of events in my email that it added to my calendar. What’s the problem? Why is this so bad? These flights are not my flights. These are flights on a friend’s itinerary who’s coming to visit in a few weeks!! It’s wonderful that Google’s technology is smart enough to look into my email and identify actual events. But, the problem is that Google can’t identify if those events are my events, or someone else’s events. So as a user, I’m stuck with events on my Google Calendar that aren’t even mine. And worse, I tried to edit the event to say “Courtney’s Flight” so it was clear it was her flight and not my flight. But, I couldn’t edit the event on my calendar. So I just deleted it. There are so many use cases that could lead to events that are not mine being automatically added to Google Calendar. I’m actually really, really surprised that something so simple as this could have been overlooked! People forward itineraries, tickets, and events to each other all the time! There’s a big risk that a lot of people’s calendars are going to get innundated with events that aren’t theirs! To be fair, users have the option to turn off this feature. But, I have no idea how it got turned on. I think it was just turned on one day and it was announced to me through the email I received! In the website explaining Events For Gmail, there is a part that talks about how one feature is that if the event gets changed, then it will automatically get updated in your calendar. For example, if you get an email that says a flight time has changed, then the flight’s times on your calendar will change. I admit, that’s useful! But, I think overall, Events for Gmail is a great example of a feature that was probably technology driven and not driven enough by understanding users, their needs, and how this product and feature would fit into their lives. If I’d been brainstorming this feature, I definitely think that I would have realized that although it’s a good idea, there’s a lot of events in people’s email that are not their own events. Back to my original point, Google has frustrated me with this feature and the way they introduced it. Making it be on automatically and forcing me to opt-out isn’t very user-friendly! However, because my life is tied to Google Calendar, I’m not going to switch. Would you find it useful to have events automatically added to your calendar based on your emails? Do you think you’d end up with a lot of wrong events (because friends forward events, itineraries, etc)? How could Google improve this feature to make it more accurate?